For use in treatment rooms or home use. BIOFREEZE was created by Dr. Dann�� King, an internationally known botanical chemist. BIOFREEZE contains an herbal extract from a South American holly shrub. ILEX is used around the world in various health and wellness formulations. The result is a fast-acting, deep penetrating, long lasting pain reliever. 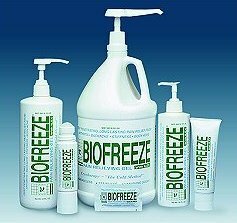 BIOFREEZE can effectively help relieve pain from sore muscles, muscle sprains, back, shoulder, neck pain, arthritis, painful ankle, knee, hip and elbow joints, and muscular strains. 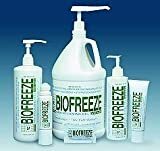 Use BIOFREEZE to relieve pain prior to ultrasound treatments, massage therapy, soft tissue trigger point therapy, rehabilitation exercises and pre and post workout stretching.